The yellowtail (£15.00) was equally tasty but we also found the accompanying truffle dressing to be slightly salty and not as aromatic as it could have been. The chef’s choice omakase sashimi selection (from £60.00) proved to be an exceptional platter of sashimi, with each piece of delicious seafood being perfectly fresh and beautifully cut. Pictured from left to right we had the turbot, fatty toro tuna, medium fatty chutoro tuna, yellowtail, seabream, salmon, seabass, scallops and ikura (salmon roe), with our personal favourite being the chutoro. Although not as fatty as the toro, this piece of fish was exquisite. We also tried the salmon (£4.50 per piece) and toro (£8.50 per piece) from the aburi nigiri section. 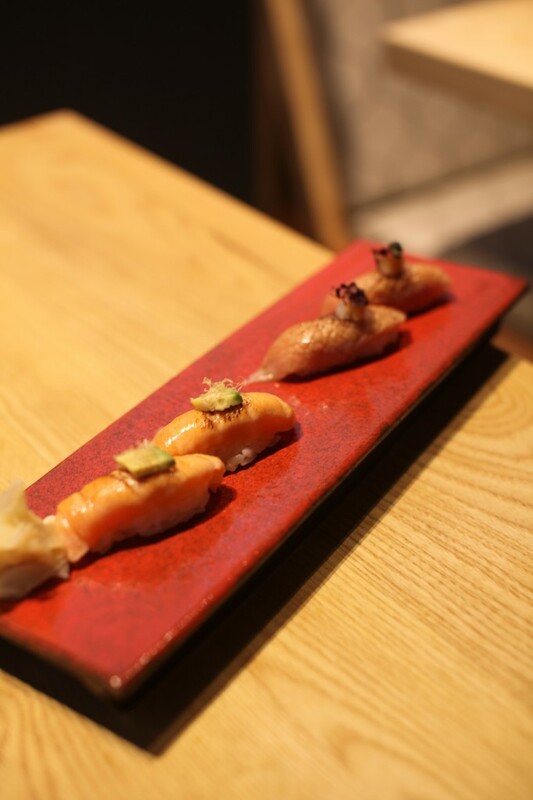 These are slightly different to the traditional nigiri in that they are seared and then flavoured with soy sauce so that no additional wasabi or soy sauce is required. The fish was again wonderful, and the fact that it had been seared gave the fish a nice smokey flavour. The seasoning was perfect, and the rice was also really well prepared with a balanced amount of acidity and sweetness. 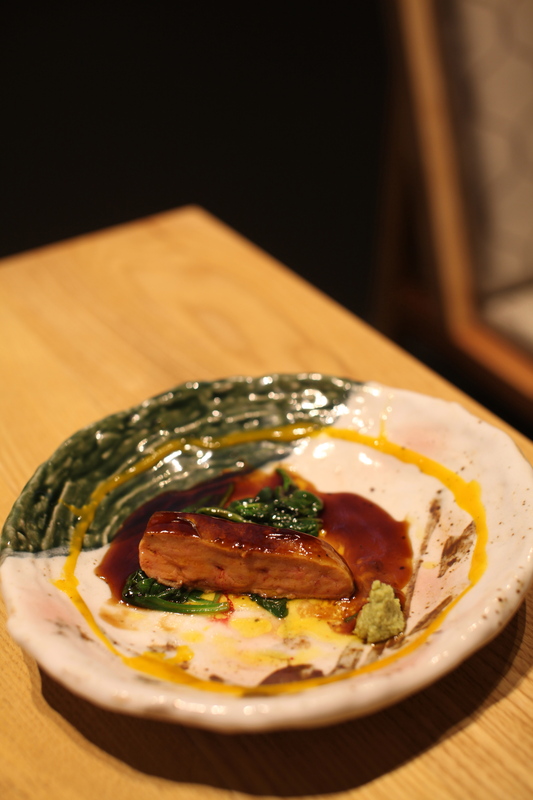 We moved onto the cooked dishes next, and the highlight was the foie gras with spinach and teriyaki wasabi (£12.00). The foie gras was glorious, being fatty and unctuous, and it contrasted beautifully with the sticky and sweet teriyaki wasabi sauce. Furthermore, it was also a very generous piece of foie gras and incredibly good value at only £12. Many London restaurants charge far more for foie gras and offer far less. 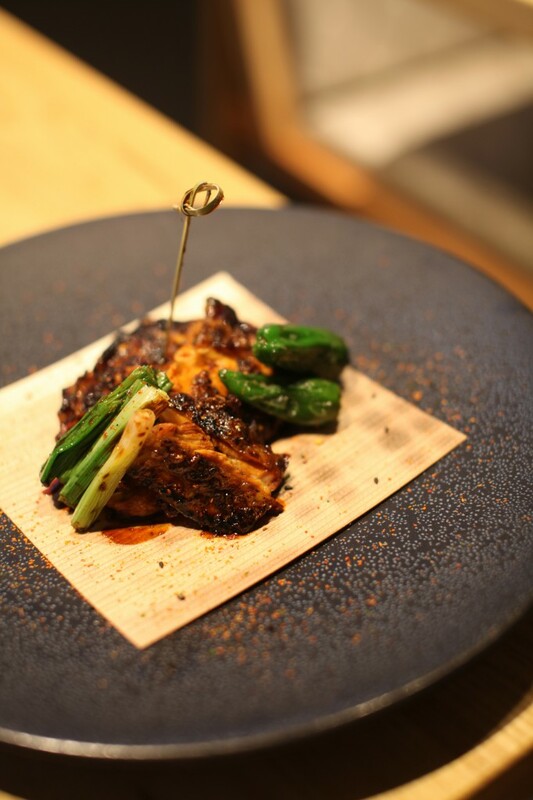 Yaki tori tare (Chicken yakitori – £12.00) was another tasty dish. The chicken was well cooked, very juicy and moist. It also had a lovely charred flavour that gave the skin a nice caramelisation and stickiness. 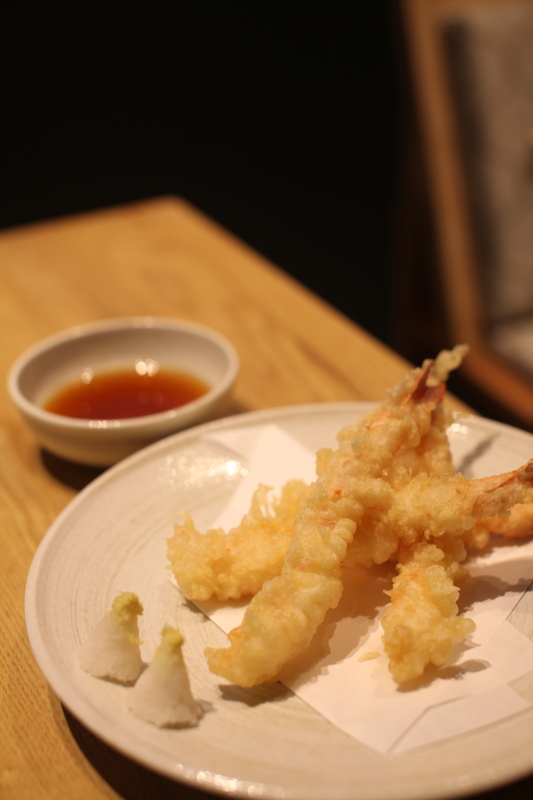 Prawn tempura (£12.00) was a great take on the classical tempura dish. The prawns were sweet while the batter had a lovely texture that was crispy and crumbly. Roasted baby chicken (£12.00) was very appetising. 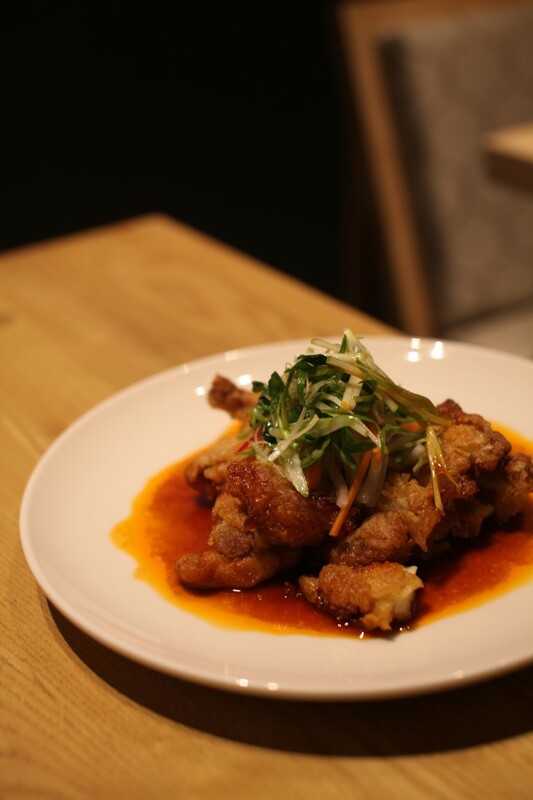 Using corn fed chicken which gave the flesh a wonderfully sweet flavour, it was well-cooked and tender. There was also a nice crispy coating on the chicken that delivered a lovely crunchy effect. The chilli sauce was sweet and spicy which worked really well with the chicken. The least successful of all the meat dishes was the lamb chops with a spicy miso paste (£12.00). This was not a good dish because the lamb was very chewy and the spicy miso paste was too thick and overpowering for the lamb. However the accompanying roast vegetables were well roasted and tasty. Moving onto desserts and the tart au mont blank (chestnut tart) with rum raisin ice cream (£9.50) was a beautiful dessert. Consisting of a creamy chestnut paste that sat on buttery biscuit base, a layer of fluffy sponge cake and some cream, we simply could not get enough of this dessert. 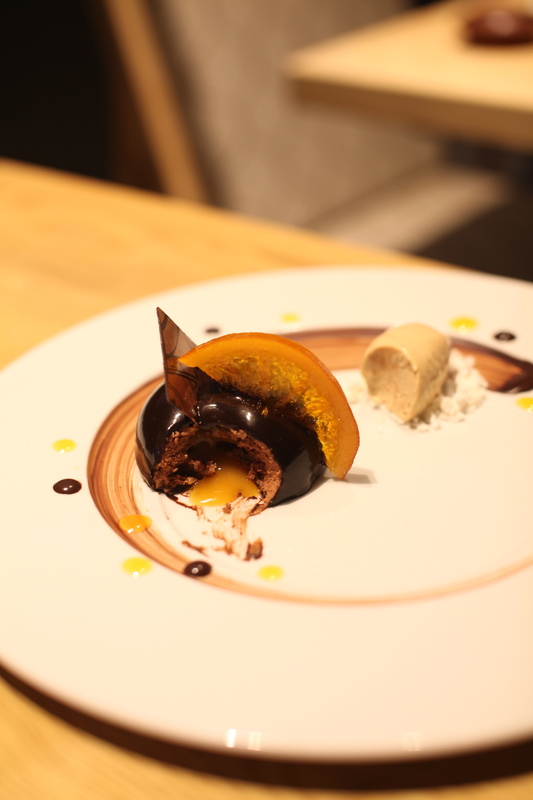 This dessert was wonderfully light, and the flavours and textures worked really well together. 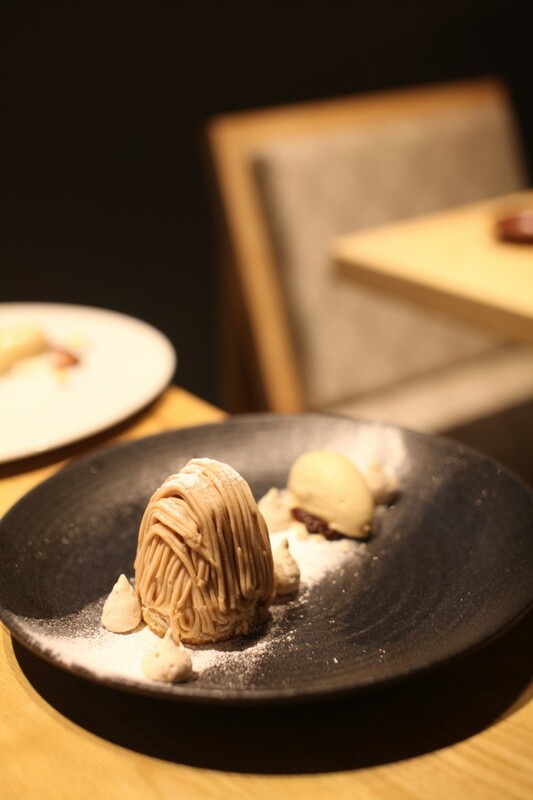 Chestnuts are popular in Japanese desserts, and this tart showcased a skilful fusion of both Japanese sensibilities and French pastry techniques. If you like chestnut desserts, then this was one worth fighting over. The rum ice cream was an interesting pairing, but it worked. Dark chocolate mousse (£10.50) surprisingly contained a runny gooey apricot brandy sauce which delightfully revealed itself to us when we broke open the mousse. The mousse was light as a feather, decadently rich and lovely with the sauce. It was also artistically presented with a chocolate coating and some edible gold shimmering across its surface. 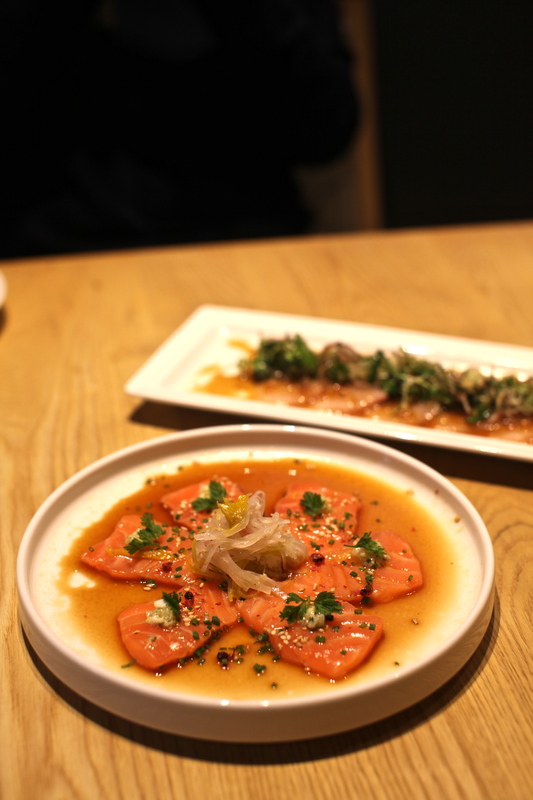 We were thoroughly delighted with our overall experience at Kouzu, which offers some of the best quality sushi and sashimi to be had in London. 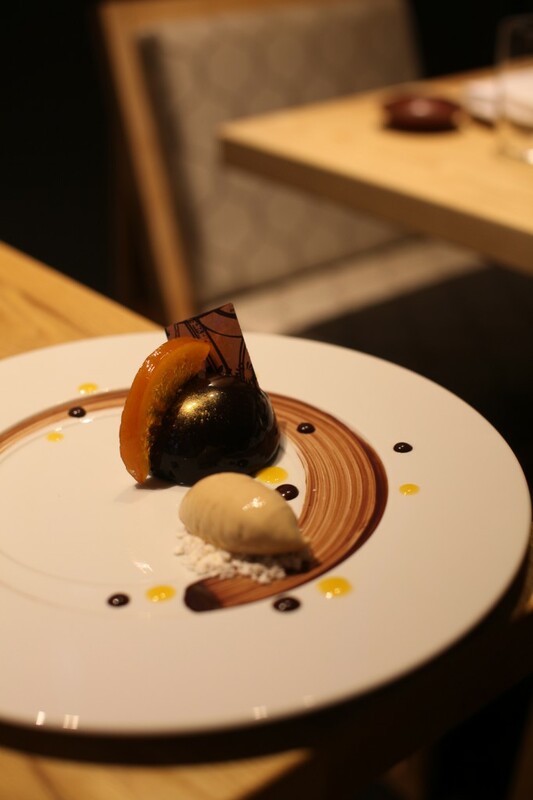 We liked most of the cooked dishes, loved the desserts and thought highly of the methodical, attentive service. 1) The wonderfully fresh and delicious seafood. 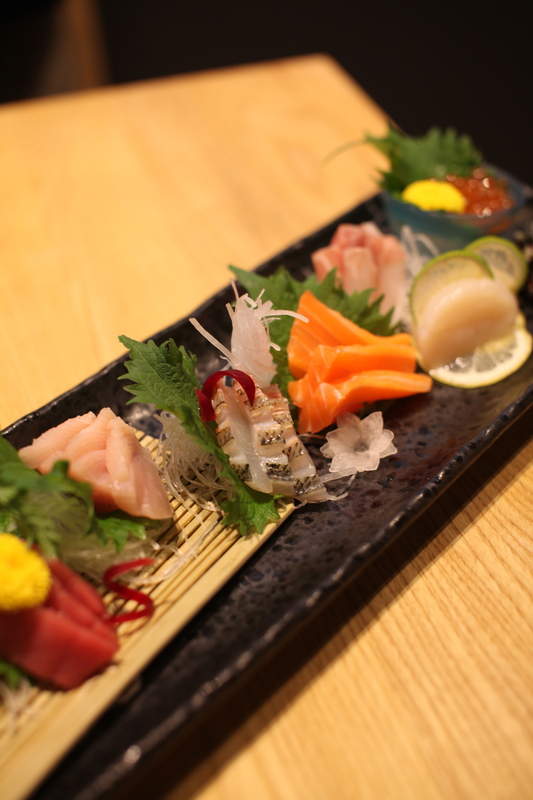 2) The traditional omakase sashimi and the aburi nigiri. 3) The foie gras dish which was not only delicious, but generous in size and very good value. 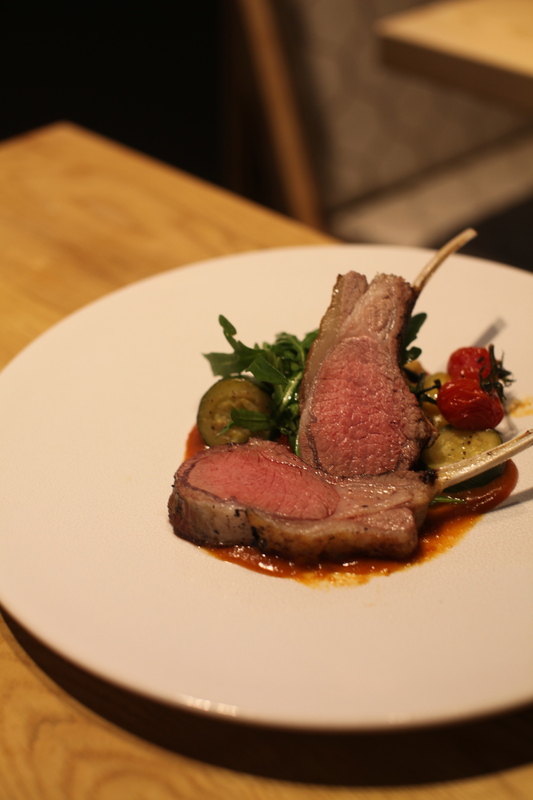 4) Most of the cooked dishes except the lamb. 5) The desserts, particularly the chestnut tart. 6) The service which was methodical and attentive. 1) The ‘new stream’ sashimi. The fish was good, but the seasoning in the sauces was overpowering and salty. 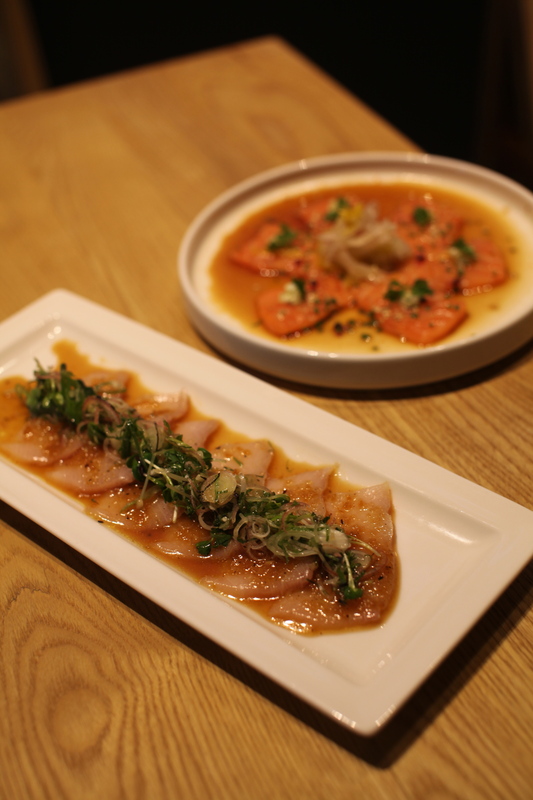 We thought this of both the ‘new stream’ sashimi plates that we tried. 2) The lamb as it was very chewy. 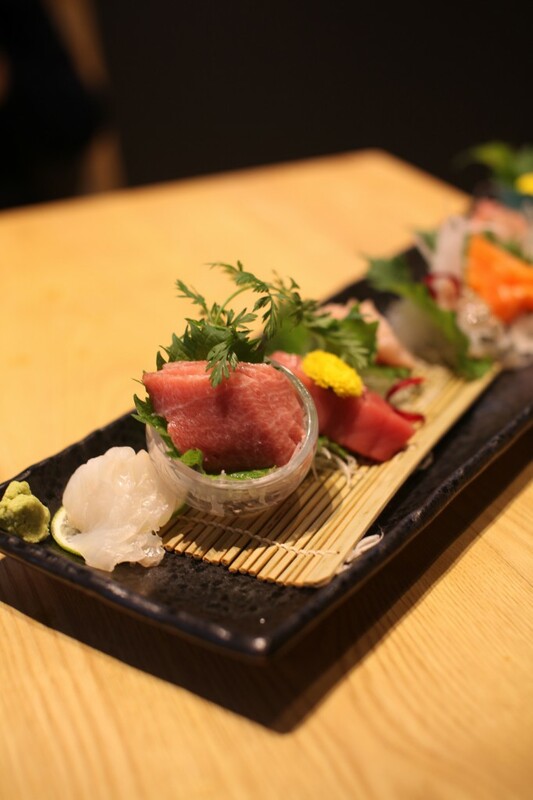 Prices: Japanese food is very much for sharing so prices will depend on how many plates you order and whether you go for the individually priced nigiri, etc, but the average starting price for a small plate, main dish and a dessert at Kouzu is from £45. Excludes drinks and service. Glad to see you enjoyed. I fell in love with that chilli chicken! Hi Gary, Have you been to Kouzu? The chicken was good, but I loved the foie gras dish.